Before he left office President George W. Bush made sure to honor Ambassador Ryan Clark Crocker for his outstanding service to his country. 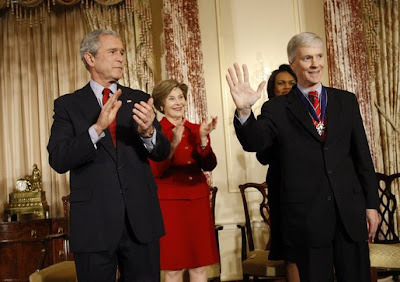 Crocker is the top US diplomat who delivered Iraq from chaos to democracy. 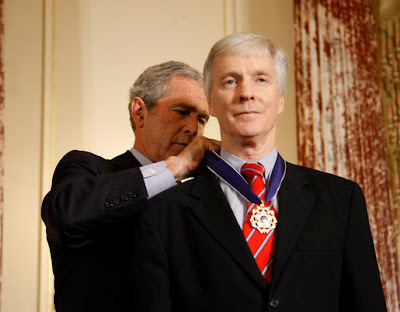 The President awarded a Medal of Freedom to Ambassador Ryan Crocker on Thursday. Two years later, Iraq is becoming a rising democracy, an ally in the war on terror, an inspiring model of freedom for people across the Middle East. When the story of this transformation is written, historians will note the extraordinary partnership between two exceptional men: General David Petraeus and Ambassador Ryan Crocker. As the General carried out a surge of military forces to improve security, the Ambassador led a civilian surge to improve everyday life. In December, after months of intense negotiations, the world saw the culmination of Ambassador Crocker’s masterful diplomacy — two historic agreements for long-term cooperation between the United States and Iraq. David Ignatius at The Washington Post wrote about the career of Ambassador Crocker today. It is an excellent article on this admirable public servant.